Nikolov and Zeller claim that planetary surface temperatures are set by surface pressure. Published in a journal indicted for fraud. They even go so far as to assert that there is no greenhouse effect. Or that it's 90 K, not the usual 33 K we have all seen. (Which, by the way, is a heuristic calculation only.) Hard to keep their claims straight. This is obviously bull -- but why? Because N&Z did no science -- they just fit 5 independent data points to a curve of 6 independent data points. Just curve-fitting. I trust you understand why that's trivially easy to do, and why it's not science. But they insist they have made a ground-breaking discovery, a la Galileo or Newton. But here's the thing -- their claim isn't even in accord with basic physics. where "s" stands for surface. But this is wrong, for the simple reason that a higher surface pressure leads to a lower surface temperature. And it's not difficult to understand why. So lower pressure means less scattering of sunlight, so more of it reaches the surface. The surface is warmer at lower pressure. That's not surprising -- though N&Z choose to turn their back on this physics. And a warmer surface means a higher temperature in the lower troposphere, which in turn means the air holds more water vapor. (See the Clausius-Claperyon equation.) That water vapor increases the greenhouse effect, leading to an even higher surface temperature. So the idea that pressure somehow creates a higher surface temperature is clearly wrong. Atmospheric pressure does not increase incoming shortwave radiation -- radiation from the Sun. It decreases it. Naturally (and unfortunately), Nikolov and Zeller have ignored all questions about this on Twitter, as if they think blatantly ignoring these question about the physics will get rid of these inconvenient questions, and their stolid, unenlightening, unphysical curve-fitting will shine through. This is why they're properly classified as "deniers." Real scientists and real people do not ignore questions, if they're interested in getting at the truth. If you don't want to be labeled a denier, don't act like one. NY Times: "Two studies of the storm that overwhelmed Houston last summer say global warming made the rain much worse." 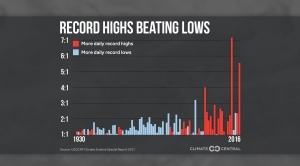 From “Daily record highs are vastly outpacing daily record lows in the U.S.” Climate Central, 12/6/17. I've made a "major discovery" -- for the five solar system objects considered by Nikolov and Zeller, their Principles show that an object's Global Mean Annual near-surface Temperature (GMAT) is exactly determined by its radius. And I only used five free parameters. Their model uses six. Eli Rabbet has a nice post about the games Nikolov and Zeller are playing. Nikolov is all over Twitter proclaiming their "new discovery," which is nothing more than curve fitting with almost no physics involved. ≧ 2 can play at that game. Data via US EIA and FRED.